For some reason 2012 has become the year of the powerful female singer-songwriter releasing an album after a long hiatus (Fiona Apple, Cat Power, Sinead O’Connor) or trying to come back from a disappointing effort (Regina Spektor, Norah Jones). 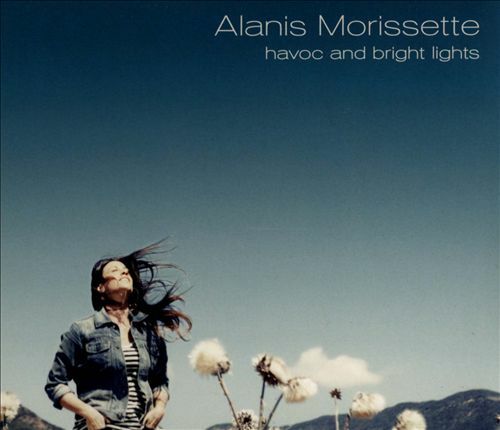 Alanis Morissette is trying to capitalize on this trend with her first album in five years, Havoc and Bright Lights, and I fully expect Natalie Merchant and Sarah McLachlan to pile on as well. In all seriousness, I haven’t listened to an Alanis record since Supposed Former Infatuation Junkie (her sophomore album), and was shocked to learn she has released three albums in the interim between Junkie and Havoc. Alanis recent work has literally been more of a part of my consciousness through her appearance on a couple of seasons of Weeds, than she has been through me listening to any of her recent music. This is strange, because I’m not sure Alanis ever did anything to lose me as a fan. I still revisit Jagged Little Pill, and the magnificent “Uninvited” quite often. I think more than anything, her past three albums have not gotten any singles press, and she just kind of faded out of my view. That is all about to change, and I am going to lift my blinders to Alanis Morissette for better or for worse.